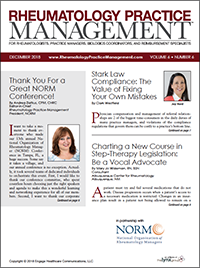 In your background as a rheumatology practice manager, it is likely that you’ve had ≥1 business experiences that practice managers across the nation would want to read about. High-interest topics include the solution you found to a practice management challenge, reimbursement, your experience with electronic medical records, Medicare audits, a memorable encounter that shaped the way you now run your business and/or practice medicine, or how you successfully integrated ancillary products and services into your practice as a revenue generator. We want to hear from you! Submit a 600- to 1500-word original article to Rheumatology Practice Management that your fellow practice managers will want to read.